The opening day of the trout season 2016 was quite demanding. On the 16th of March, I was not able to catch a fish. However, the first few days of the new trout season see a lot of anglers at almost every major river. I fished nymphs as well as dry-nymph rigs to get down deep. Unfortunately, even very deep fished nymphs were unsuccessful. Nevertheless, my spirits were high and I loved to be wading in a river again and testing the recently tied flies. Although, the water was pretty cold. Furthermore, I realised that I have to spend some more hours in a gym hall in order to improve my casting style. Given that the start of the trout season was rather slow, I continued exploring other rivers in search of trout, who were willing to bite. Therefore, I ventured for example along Jura mountain streams on my own or in company with my fishing buddy André. It was not long, until the first accomplishments resulted. The satisfaction of catching trout in new waters is unparalleled. With rising temperatures the trout began to feed vigorously on may flies. Thus, dry flies brought great fishing moments. Rising trout were observed on several occasions and mostly they could be easily convinced to bite. This was just superb dry fly sight fishing. I had never experienced this in Switzerland before. The fly I used the most was the Royal Wulff with oversized wings. 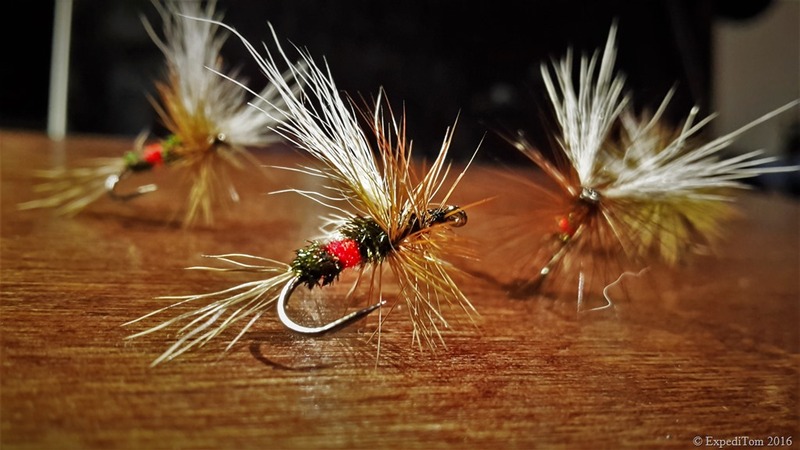 Once, I approached a pool where I had caught already trout on dries and decided to go for a Deer Hair Sedge rather than the approved Royal Wulff. As a result, I had no bite at all. Changing the fly suddenly brought fish to the net. Since this happening, I am a believer of selectively feeding trout. Furthermore, I undertook fly fishing trips with friends. Among the most memorable ones are the trip into the Swiss Alps with Firebelly, fly fishing in the Canton Schwyz with Claudio, as well in the Canton of Vaud with Petteri. On these adventures, I realised how splendid opportunities we have here in Switzerland. It is not needed to travel thousand of kilometres to experience fly fishing in pristine nature where one can dangle our soul. 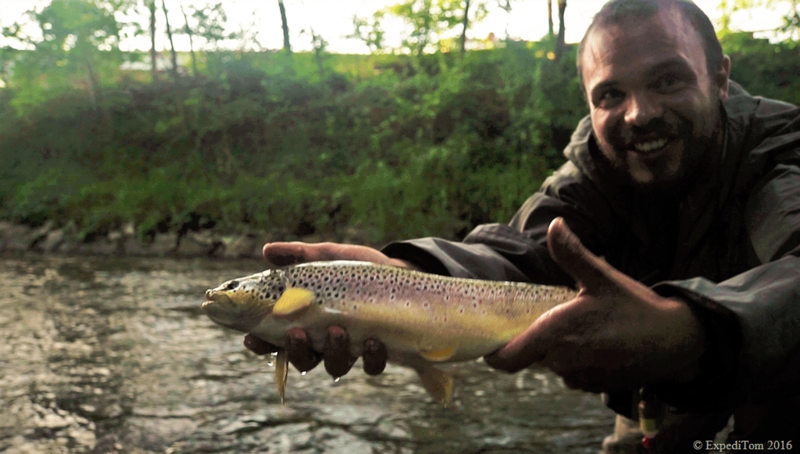 […] sharing great moments with friends doubles the joy and lessens the anger when loosing a fish or a fly. Moreover, I appreciated the fly fishing together with like-minded people. It is true that sharing great moments with friends doubles the joy and lessens the anger when loosing a fish or a fly. Sharing this moments and my passion with beginners excites me everytime anew. Moreover, it was my first year I took fly fishing novices like Andy and Jan with me. We had always a great time and both of them managed to catch a trout. These moments, when a beginner catches his first fish on a fly, is a priceless moment. Sharing this moments and my passion with beginners excites me everytime anew. Having written about Summer with distinctive hatches, I want to turn my attention now to the fall. For this part of the season I had high expectations because I caught the largest trout during this time in previous years. With high spirits I ventured along several different rivers and explored some new waters too. However, it was in the river I had fished during the trout season opening that I finally caught a larger trout. In the early evening, I was fishing a indicator-nymph rig with a heavy spider jig nymph. Similar to the Guide’s Choice Nymph. An inlet of a small tributary had formed a distinctive pool. It took several casts until a hesitant sinking of my indicator alarmed me. I set the hook, but expected to having a snag due to the slowly sinking indicator. I pulled some line in to check, whether I could free the hook without having to walk into the pool. All of a sudden, the leader began moving upstream. Shocked by the accelerating speed, I quickly reeled in the slack line. Having the camera hanging around my neck and the net already pulled from the magnet, I hurried downstream in a rather amusing fashion. I managed to reel the slack line in and tried to pull the fish to the slow-moving water at the end of the pool. Unfortunately, the trout had other plans and continued its way upstream and turned straight right into the main current. Bugger. The run began. Having the camera around my neck and the net already pulled from the magnet, I hurried downstream in a rather amusing fashion. After at least 30 metres, I finally managed to net the fish. What a trout! All in all, I had a splendid trout season. I caught several trout during almost the whole season. Although, the start was slow, it is in my opinion necessary to have those unsuccessful moments too. Otherwise you do not appreciate your great moments enough. Moreover, is not every fishing day a good day? The size of the trout varied widely. Only some larger trout were caught, in contrast to heaps of small ones. My favourite dry fly of this season was the Royal Wulff with oversized wings. How about your trout season? I would love to hear your stories too.